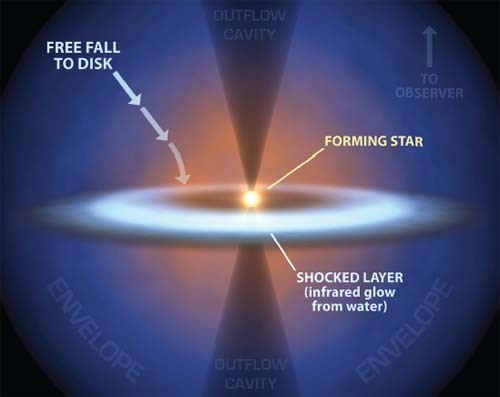 What is a T Tauri star? Named after the first object of its class, a T Tauri star is an intermediate-mass star that is very young. It is probably so young that nuclear fusion has not yet begun at its core, or maybe has just begun. The material surrounding the core has not yet settled into equilibrium, so much of it is still falling in toward the star’s center. Meanwhile, the infall is creating huge amounts of energy that comes outward from the center in the form of strongly gusting stellar winds. Because of this, the center of the star is obscured from view by all the swirling dust and gas.